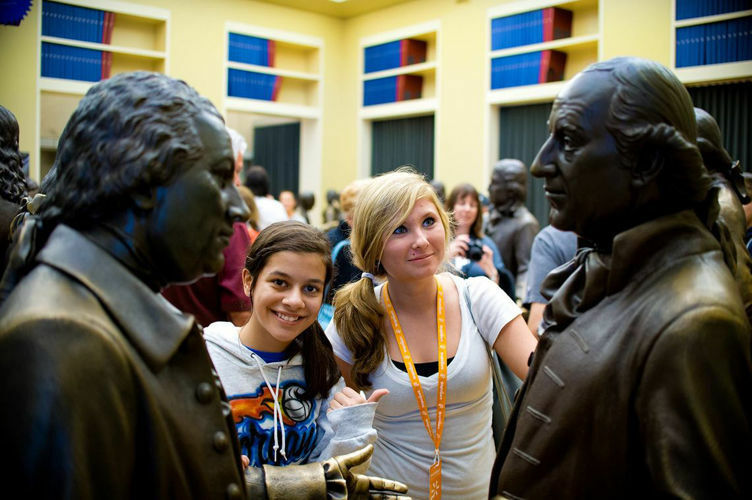 One of the National Constitution Center’s most popular and iconic attractions, Signers’ Hall invites you to walk among the Founding Fathers who added their name to the Constitution—as well as those who dissented—on September 17, 1787. Signers’ Hall brings to life the final day of the Constitutional Convention in the Assembly Room of the Pennsylvania State House, now known as Independence Hall. There are numerous famous faces in the room, including George Washington, Benjamin Franklin, James Madison, and Alexander Hamilton. Pose beside your favorite Founding Father for a great photo op! The statues in Signers’ Hall were created by artists at Studio EIS in Brooklyn, who used numerous historical sources, including portraits and written descriptions, to create the most accurate likenesses possible.